soldier penpal like and will send a carepackage or that's the plan - The Fractal Core - Off Topic Discussion - You have arrived in the LEXXVERSE where the spirit of Lexx lives on. Hello Abby I might make the other half an Xmas package I can send hot chocolate and marshmallows and peppermint candy and things lol. I got this lovely colored pens and I'll use them to decorate the envelope or write the address in different colors. Heck i used them to write Jim a 6 pg letter changing colors after do many sentence lol. I had fun doing that so i might do it again at some point. I should go to the dollar tree and get stickers to decorate the letters. I have drawn on the front a few times on them in the past and now. When I have time and in a drawing mode. I can make him a picture and send it in the next letter or have my brother draw him one maybe get some paint and but my son's hands on paper. And writing thank you for making my future safe or something. Idk I will have to think on that one a bit more hahaha. It's going to be impossible to get a package there exactly in time for Christmas. Alot of these guys are in remote regions or constantly moving, so just send it a month or two ahead of time. 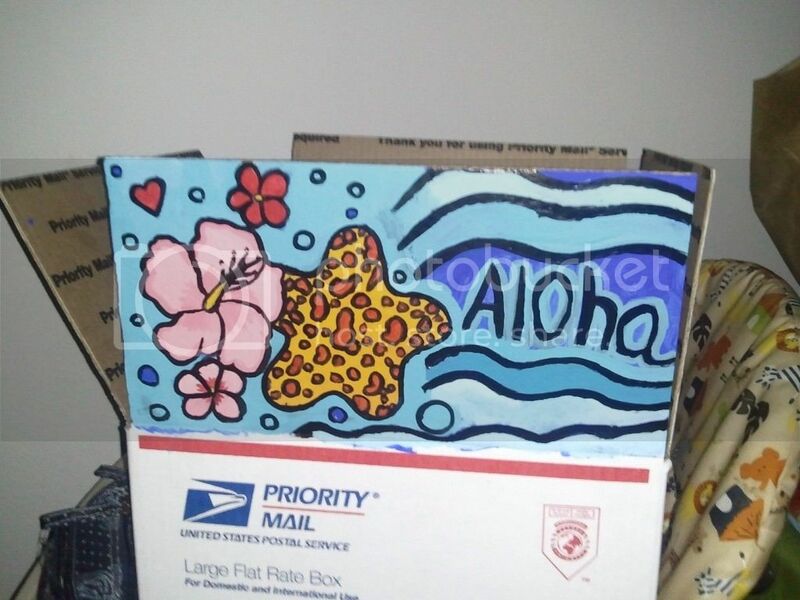 ok thx maya i painted a lovely drawing on the inside flap of his box. so when he opens it he will be cheered up some. it was a hawaiian theme i'll post it. i like to draw on the envelopes at times too. that is tricky it's such a small space lol. i think he will like them i'm no artist. but if i enjoy making them and if it makes him smile when he sees them then that's all that matters. plus i get to do something i enjoy and get to practice shading with my color pencils and paint and get messy lol. little bit of heaven and a beach lol relaxing destresser i think when he looks at it. That can't help but bring a smile to his face. hello, udate i got an email from my soldier Victor and i did say i would share and tell ya when i got word. Tell Ron he is a lucky guy to have such a kind hearted woman like you. I will try my best to email soon. Hope to hear from you soon! this made my day so amazing i'm so happy and to know i helped him out. this is why i choose to help if you guys would like to do it as well let me know. i can post the link to the site i joined and you can check them out. That is a very rewarding letter, and he sounds very appreciative. Our troops don't have it easy and you're bringing a smile to his face. Yeah it sure was I was sharing what he wrote to everyone i know. He seems like he is wanting to keep intouch as much as he is able. My first soldier was one of few words he send me three emails two when he was doing his toure. one when he was home and said it was oke to write him still. so i send hima father's day card his wife a mother's day card with a ten dollar gift card to target. then one for the major holidays thing till he tells me to stop. so it's very exciting to hear he wants to try to send word when he can. on the packeage i send him i put a notepad and ten envelopes and a pen. so he could write home incase he had no supplies and i think it was a good idea. i can send more envolepes i found my other box. i have an idea on what to send i need to go to a milatery store and get a can opener those small ones they can carry it with them. not weight so much and taking alot of room. so i'll let ya know what else happens when he writes next. also be posting the list of what i will be sending to him. the site is http://adoptaussoldier.org/ so you can check it out to learn more. or you can even do what i do. Well thank you so much for understanding in my situation. I am grateful to have your company and care while I am here. You are the best! I don't have a real can opener but my field knife will work. Lol Seeing that your such a great caretaker, is there anyway you can send me some whey protein? I would be very thankful for some if you could do that. I am into working-out but I don't have access to the proper supplements to reach the goals I want. If you could do that, that would be great. I will attach a picture to to this email so you and your family can put a face to the soldier you guys are taking great care of. Hope to hear from you soon! Those poor soldiers have such rough conditions and hardly anything, I think you're doing a great thing! he is a cool guy i just can send the whey protein to him. the who shipping thing is not working lol complicated. also just not money for anything right now. but lucky for him he has a few other people that also show the support. so hopefully one will help him out on that. but i could send protein bars at list it would be something. they might help him a little bit not as good as the whey. but it's better then nothing i'm sure. i have a few friends who were in the middle east and their stories moved me. it's a good feeling giving and helping someone who needs it. but rewarding when it's a soldier who is giving way more then me. i live very spoiled i have it to good. while they strugle day to day for things i have laying around the house or when i go to the store. this weekend i have a ren fair i'm part of ^^ geeking out on it. i'm going to send pictures of that to him lol he might like my hobbie. i do and send what i can afford so i'm very happy to do it. i always share it and tell people to check the site and if they can to join in and support. That is so nice that he e-mails you!